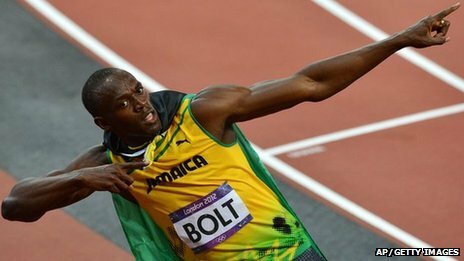 Scientists say they can explain Usain Bolt’s extraordinary speed with a mathematical model. His 100m time of 9.58 seconds during the 2009 World Championships in Berlin is the current world record. They say their model explains the power and energy he had to expend to overcome drag caused by air resistance, made stronger by his frame of 6ft 5in. Writing in the European Journal of Physics, the team hope to discover what makes extraordinary athletes so fast. According to the mathematical model proposed, Bolt’s time of 9.58 seconds in Berlin was achieved by reaching a speed of 12.2 metres per second, equivalent to about 27mph. 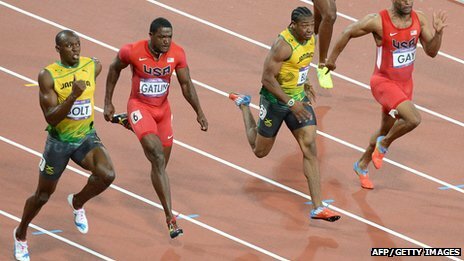 The team calculated that Bolt’s maximum power occurred when he was less than one second into the race and was only at half his maximum speed. This demonstrates the near immediate effect of drag, which is where air resistance slows moving objects. When comparing Bolt’s body mass, the altitude of the track and the air temperature, they found out that his drag coefficient – which is a measure of the drag per unit area of mass – was actually less aerodynamic than that of the average man. Jorge Hernandez of the the National Autonomous University of Mexico said: “Our calculated drag coefficient highlights the outstanding ability of Bolt. He has been able to break several records despite not being as aerodynamic as a human can be. 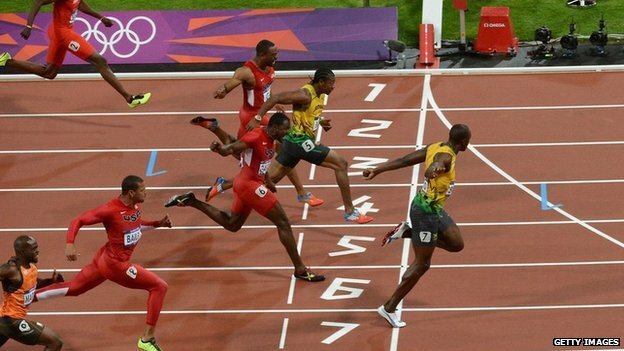 “The accurate recording of Bolt’s position and speed during the race provided a splendid opportunity for us to study the effects of drag on a sprinter. “If more data become available in the future, it would be interesting to see what distinguishes one athlete from another,” added Mr Hernandez. Bolt’s time in Berlin was the biggest increase in the record since electronic timing was introduced in 1968. John Barrow at Cambridge University who has previously analysed how Bolt could become even faster, explained that his speed came in part due his “extraordinary large stride length”, despite having such an initial slow reaction time to the starting gun. He said Bolt has lots of scope to break his record if he responded faster at the start, ran with a slightly stronger tail-wind and at a higher altitude, where there was less drag. Bolt’s Berlin record was won with a tail wind of only 0.9m per second, which didn’t give him “the advantage of helpful wind assistance”, he added. 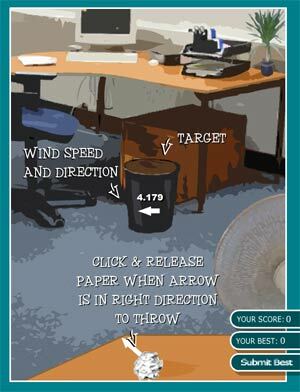 “You’re allowed to have a wind no greater than 2m per second to count for record purposes, so without becoming any faster he has huge scope to improve,” Prof Barrow told BBC News. A common problem for teaching Physics when you are not a Physics teacher is that you make many mistakes with complex ideas which appear simple on the surface. I drop a ball to the earth and want to work out the distance fallen in a certain time. I then do a calculation of..
Now we can reason this out. If I allow a ball to fall to earth it must accelerate due to the field of gravity around the earth 9.81N/kg. Or 9.81 m/s/s. But where does the formulae come from that we general use? So the question is what is it all about. Well we need to think way back to the idea of a simple idea of how to work out the distance travelled by a runner in a race. Now this works fine if we are travelling at a constant speed but hey as you know this is not always the case and sometimes an object has a constant acceleration or deceleration. If you think about a graph of a person who got faster and faster then we would have a slope or triangular area on a speed-time or velocity-time graph. Now the area under the graph would be the distance travelled on the journey. But if our speed changed s=vt (for constant speed) becomes…. Now we can use this in a rearranged form..
Add ut to both sides, multiply by 2 and tidy up.. So we now have the four equations of motion for an object which is travelling at a constant velocity or accelerating at a constant rate. As shown you can reason them all out with very simple ideas from first principals. You can also call them whatever number you want as some people label them differently. So hopfully we have now understood where the formulae comes from and realise that if we drop a ball we must apply the formulae to work out the distance fallen in a more complex way. Of course, it will be ut for the whole time and then you take away a little bit of “s” from the other term as you slow.